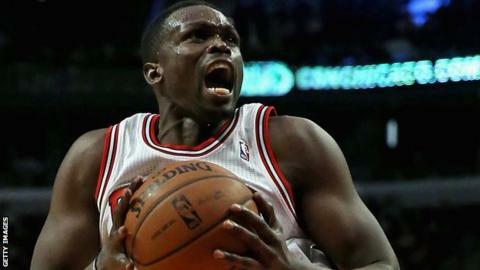 Deng has twice earned selection as an NBA All-Star. Great Britain and Miami Heat star Luol Deng says he is "proud" of his African heritage after alleged racist remarks were made about his South Sudan roots. Atlanta Hawks manager Danny Ferry said Deng, 29, "has a little African in him", among other remarks. Ferry said the words "do not reflect his views" and claims he was repeating from scouting reports, but he will be disciplined by the Hawks. "I actually have a lot of African in me, not just 'a little'," said Deng. Deng was born in what is now South Sudan, though his family escaped civil war by going to Egypt before being granted political asylum in Great Britain when he was five years old. He played for the Chicago Bulls between 2004 and 2014 in the NBA before joining Miami Heat via a short stint at Cleveland Cavaliers. "For my entire life, my identity has been a source of pride and strength," he said. "Among my family and friends, in my country of South Sudan and across the broader continent of Africa, I can do no greater privilege than to do what I love for a living while also representing my heritage on the highest stage. "Unfortunately, the comment about my heritage was not made with the same respect and appreciation." Hawks co-owner Michael Gearon Jr, has said he recorded the conversation in which Ferry made his remarks about Deng. Gearon included the quotes in a letter to majority owner Bruce Levenson that called for ex-NBA player Ferry's resignation. Ferry has said he has no plans to resign. "In regards to the insensitive remarks that were used during our due diligence process, I was repeating comments that were gathered from numerous sources during background conversations and scouting about different players," he said in a statement. "Those words do not reflect my views, or words that I would use to describe an individual and I certainly regret it." He added that he had "reached out" to Deng on Monday. In other controversy over race, the Hawks uncovered an email written by Levenson that discussed the lack of white fans at the team's home stadium when looking into Ferry's comments. Levenson has since said he will sell his controlling interest in the side. Who is in Garth Crooks' team of the week? Read more on Who is in Garth Crooks' team of the week?